By now we know about Pixar’s evil plan to take over the world through people who can’t even after all those tears, and Coco is no exception. Let’s react! If you haven’t seen it come here for the first part of the article, and to my Spoiler Free thread or read IO9's great review for a Spoiler Free version. After the spoiler tag, or in the comments, it’s No Man’s Land. Mexico approves. First things first: I have said it earlier. Many people have said it. 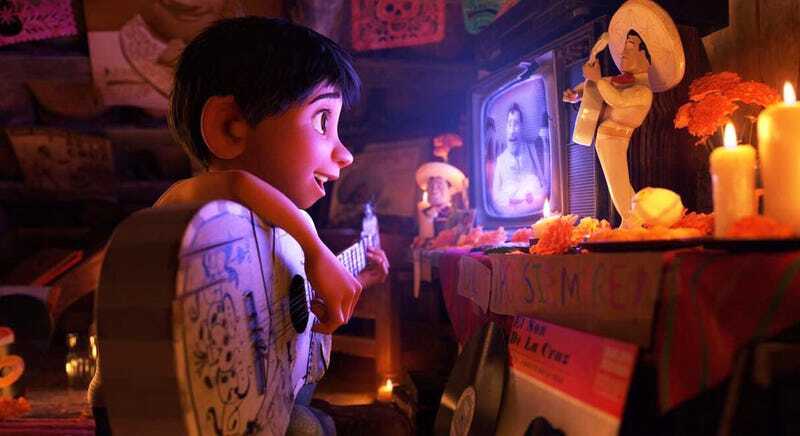 In previous articles, many reviews, and videos, but this movie is quite different than The Book of Life, and it’s probably gonna be very different than the Mexican animation Movie “Día de Muertos,” probably coming to theaters next year, I hope. Some subjects are similar, and it is based on the same Mexican holiday and the music plays a very important role, but while Book of Life is about a love triangle (Insert relevant Crazy-Ex Girlfriend video), Coco is about the importance to know and know your roots. Now we’re ready for the review. Welcome to Pixar’s first human and non-white protagonist. I hope you brought tissues, and although I am not gonna put it above Inside Out or Zootopia in the story department, this is a really good movie that pays tribute –and uses a TON of inside the culture jokes and references– to Mexican culture and customs. Fortunately, Pixar’s previous fuckups with the handling of this property led them to research and learn much more, ending up with a better movie, a more respectful one, and even with a better title. If you were worried about cultural appropriation, don’t be: Mexico approves, and the proof is that this has become in three weeks the top grossing movie in the history of Mexico. We follow closely the live and tribulations of Miguel, a charming kid who believes Music is his life, and feels a connection to his idol, a hero from Mexican Golden Cinema based on real life star Pedro Infante. The problem is, due to a story that will probably soundless ridiculous if you are Mexican, music was banned by his now late Great Great Grandmother, and enforced by his very Mexican, very lively, very fierce Abuela, the Matriarch of the house. Through weird yet predictable circumstances, Miguel ends up in the Land of the Dead, and if it reminds you of Book of Life, and Corpse’s Bride, good, because both are kinda based on the same thing. This is however an ironically lively world, full of color, saturated with details that might make it feel overwhelming, yet it works... like most Mexican art around this holiday. The extensive, and excessive use of marigolds (Cempasúchil flowers in Mexico), is fantastic and effectively reflects this mix of catholic and Prehispanic set of customs. ENOUGH WITH THE SYNOPSIS! Ok, Ok... Through so many references that even Mexicans might miss more than a few, art that both looks fantastic and resembles so much Mexican tradition, cameos from famous and obscure personalities of Mexico’s history, we have a pretty simple story full of complex emotions. With Alebrijes as characters. Full of music that will make you happy and sad, and probably cry buckets on cue. Seriously, this is the first move EVER where I’ve heard the whole theater choke back the tears at unison. The story has some very cheap shots, and ends up resembling a bit of a Telenovela, yet it works so well. Just like Inside Out, this is a movie that children will probably like, but adults will get hit in a much deeper level. It also gets a bit dark, however, it is not a scary movie, for those worried about bringing children to a movie full of skeletons. The only two things that took me out of the Mexican representation were very minor nitpicks. The first one being that I have NEVER seen a Mexican building with firescape stairs. Secondly, one of the settings reminded me more to old New Orleands than Mexico... but that might be a reference to Chapultepec or to Chinampas (the way cities were built over lakes in prehispanic Mexico). The music is fantastic and very Mexican. Although I have not seen it in English. I have to say, if you get the chance, watch it in Spanish with subtitles. Some actors are the same but in their mother language (like Gael García), but Miguel’s actor in Spanish is SO MUCH BETTER singer. This is not a Dig to the American child actor, because he is fantastic in the little bits I have heard, and has a wonderful voice. It is just that the Mexican actor, in Spanish, has such a wonderful voice. Though I might be biased. I’ll put a clip of his song in the Spoilery part of the thread. It is spoilery for a reason, I’m warning you. All in all, I say, go watch this movie. The art, music, emotions, and cultural references are fantastic. The message is awesome and a bit more complex if predictable, and the plot is simple, a bit predictable, but thoroughly entertaining. Then go the Sing app and make some videos. OK these are some spoilery impressions and comments in no particular order. It’s been 4 weeks since I saw the movie, and I am forgetting things now. I hope Gael García can forgive me. Duuude, again, the music is fantastic. I need to watch it in English to compare, some of the banda music is great. Again to the music, it’s good that Mariachis are acknowledged without being Mexico = Mariachi. Behold the power of the Chancla! That is an accurate representation of tough small town grandmothers. The surprise villain moment was mostly well handled, and probably completely unnecessary. I mean, he could have just been a regular douchebag and the movie would have worked just as well. Ugly crying break. Take 5. The Alebrijes (spirit Animals) were fantastic, and in your next visit to Mexico you can buy those things for cheap. They are very popular wooden toys. My grandma died in 2013, the day she was being released from the hospital, just before I was able to visit her. I was NOT OK during this movie’s end. Here’s a portrait I did of her a few days after. I am not religious, nor do I believe in anything magical or supernatural, so I do not interpret the simbology of Dia de Muertos literally, but it is a tradition and set of customs very beloved to me. Also, Candy Skulls were my obsession during childhood. I just loved that Frida Khalo was an important character, and as intense as she was in reality during this movie. Shot-out to that wonderful golden era of Mexican Cinema, with fantastic movies where men and women were affectively referred by cattle names. OK that was the last one. I am not gonna say no to more Tamales, but that grandma was exaggerating, damnit! Tequila shots! Then sadness. Then Music Festival! So Gael García and Diego Luna both voice a main character in competing animated movies around Day of the Dead? Are they fighting again? Can’t they just get along? !